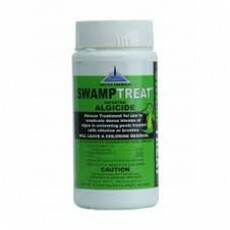 Swamp Treat is the newest formula for the worst algae blooms. It's patented formula works fast to turn a swamp pool clean in a matter of hours. What benefits can I expect from using it? Your pool will go from a green swamp to blue in as little as a few hours. As the filteration system kicks in, the pool will clear. The result is the fastest acting rescue product on the market. Best of all, you'll have a Chlorine residual after the process. No! A 1lb bottle will treat 20,000 gallons, and do in one treatment what other products take multiple times to do - and do it faster. How effective is Swamp Treat? It is so effective that you will see dramatic results in a matter of hours. What does Swamp Treat do? It accelerates your chlorine's ability to fight algae blooms- and does it so well that it can clear the worst pools imagineable. Does Swamp Treat have copper or other metals in it? No! It does not contain any heavy metals which can stain your pool. Does Swamp Treat affect my pool's balance? No! It even will leave a chlorine residual after use! Manufacturer - United Chemical Corp.